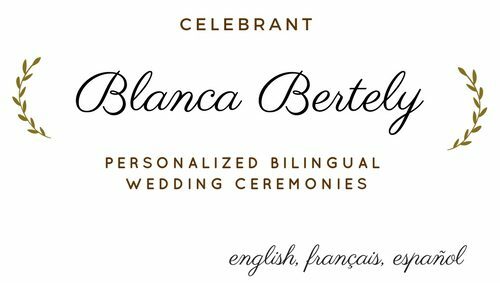 We are so very pleased with Blanca for our celebrant for our Paris, France wedding! 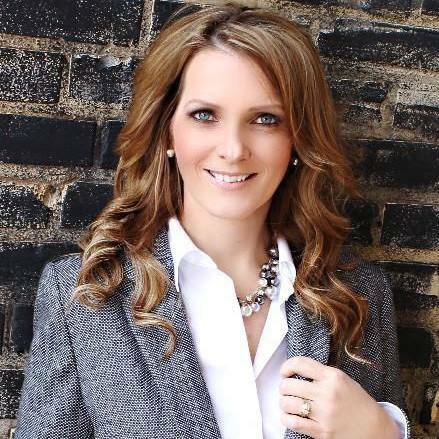 She is professional, thoughtful, articulate, well spoken, prompt, flexible, organized, and easy to communicate with. She put a lot of thought and time into preparing our ceremony and truly made it be a reflection of our love, devotion, and commitment for each other. She provided a beautiful certificate. We will treasure it for the rest of our lives, and remember her and our special day when we look at it!! Thank you, Blanca!! Youli & PM, Château Meyre, Avensan, FRANCE. July, 2018. Professionnelle et pointilleuse, elle fut un don du ciel — Professional and caring… she was godsend ! Julien et Pierre, Château de la Ligne, Bordeaux, FRANCE. May, 2018. Blanca nous a préparé une cérémonie géniale. Du début de la fin, elle a été très professionnelle et vraiment utile. 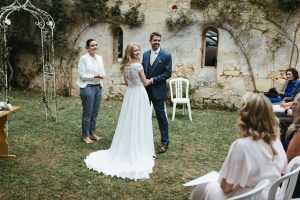 Elle nous a guidés à travers la préparation de la cérémonie laïque de notre mariage, et nous a recommandé plusieurs charmantes surprises, comme la cérémonie des vins, ou le fait d’avoir fait la cérémonie à la fois en français et en anglais. Elle est charmante et nous la recommandons fortement. Blanca prepared an amazing ceremony for us. From beginning to end, she was very professional and extremely helpful. 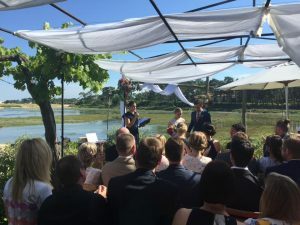 She guided us through the preparation of the laic wedding ceremony, recommended a couple of lovely ‘surprises’, such as the wine ceremony, and performed the ceremony both in French and English. 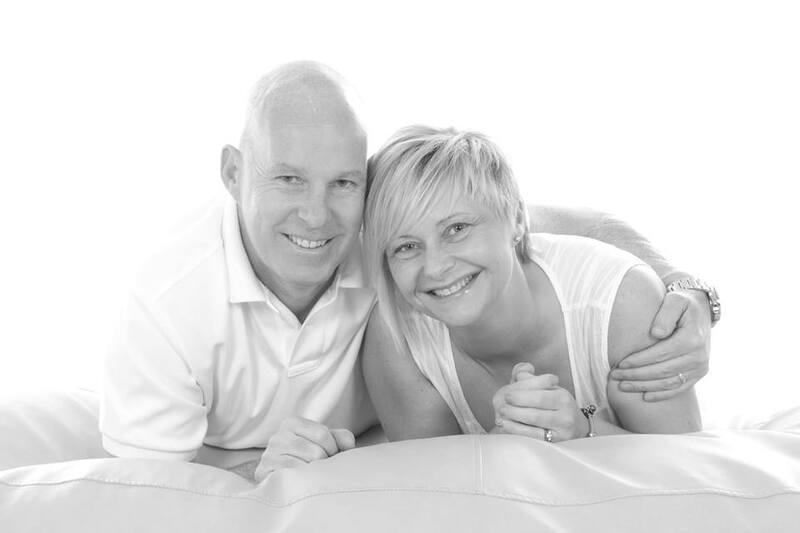 She is a lovely person to work with and we strongly recommend her! Nicola & Jonathan, Johannesburg Country Club, SOUTH AFRICA. March, 2018. EN “Words cannot describe how amazing our ceremony was. Blanca personalized absolutely everything! We talked a few times to really get to know each other and personalize the wedding and it really worked! it was such a personal wedding with a hint of religion, but not crazy. 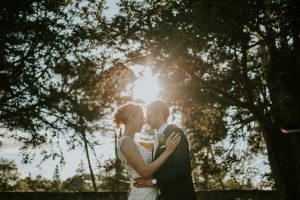 We had a French-Canadian wedding and she translated word for word the whole ceremony. 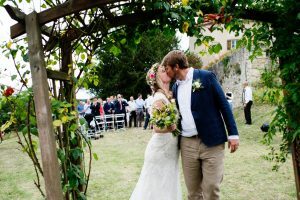 Everyone at the wedding said it was the most amazing ceremony they have ever attended and will recommend her to anyone that is getting married even if we need to fly her to Canada! I planned the whole wedding from Canada which was hard, but Blanca gave many pointers on venues and suppliers which helped SO much! Futur(e)s marié(e)s n’hésitez pas et laissez faire Blanca !!! Nous avons rencontré Blanca lorsque nous cherchions une personne pour célébrer notre cérémonie laïque sur Bordeaux, en français y en español parce que mon mari est Madrilène, et nous avons eu un coup de cœur tous les 2 pour sa gentillesse et l’amour de son métier qu’elle a su nous transmettre immédiatement ! 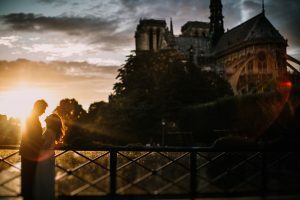 Nous voulions que cette cérémonie soit simple et en même temps émouvante et à notre image : Blanca a su nous accompagner, nous conseiller et faire de ce moment (riche en émotions!!) une réussite ! 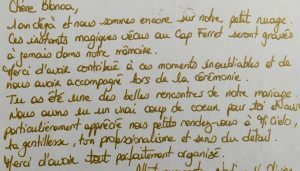 Elle a participé pour beaucoup à l’émotion partagée ce jour là avec tout le monde et nos invités nous en parle encore ! Quand à nous nous ne pouvons que te remercier Blanca pour ce moment magique ! Hi Blanca, How are you? 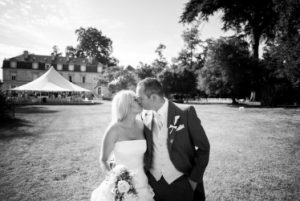 We are slowly reemerging from our wedding “week” and wanted to send out a proper thank you email to you. 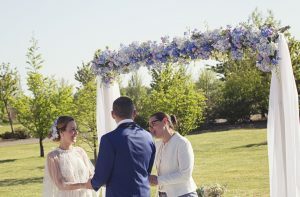 We are so happy with the way you organized the ceremony-it was really personal, funny and emotional and we couldn’t have asked for a better officiant.We keep replaying the ceremony in our minds and the guests have been raving about how beautiful the ceremony was so Thank you!! We reaaly appreciate all of your hard work and dedication to making our ceremony so perfect. Good luck with the rest of your weddings and with the pastry shop and hopefully see you one day in Bordeaux. 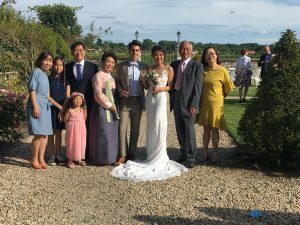 “Un grand merci Blanca d’avoir célébré notre mariage et pour ton aide précieuse lors de la préparation de la cérémonie. Cette dernière a été très émouvante et restera à jamais gravée dans notre mémoire. Kirsten and Luc. Cabane Mimbeau, Lège-Cap-Ferret, France. June, 2017. Luc and I are well, back in New Zealand now and just finished our first week back at work. We are in the depths of winter, it is cold and our tans from our honeymoon in Greece are quickly fading!! 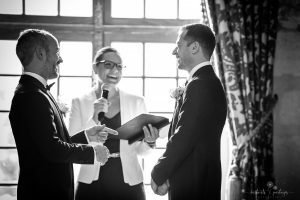 The smiles from our wedding are here to stay for a while though – what a special day, thank you so much for our wonderful ceremony, we received a lot of positive feedback from the guests about the beautiful ceremony, and the emotion in it. There was hardly a dry eye in sight! Happy tears kept on flowing throughout the evening!! The cakes were great! We also received a lot of positive feedback about how delicious the cakes were with one guest raving about it the following day say “the cake was the best part of the wedding!!”. So a very big thank you to Diego. I wish we weren’t so far away so we could enjoy his delicious creations more often! Wishing you all the best for the busy wedding season and we will definitely pass by next tie we are in Bordeaux. Many thanks again. Cankiz and Sagnak Binzet. Château de Grattequina, FRANCE. April, 2017. Thank you so much for these kind and flattering words. We sure had a great time ourselves and the feedback from the guests were also very pleasant. All the aspects were taken well care of and your part certainly boosted a good start. We are very happy about choosing to work with you. Louise and Miles Robinson, Château Pomys, St Estèphe, FRANCE. July, 2016. Lauren and Jean-Laurent Pelissier, Château de la Ligne, Bordeaux, FRANCE. June, 2016. 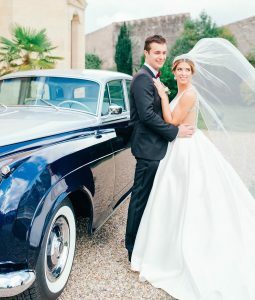 “Blanca, we cannot thank you enough for having made our ceremony so special! 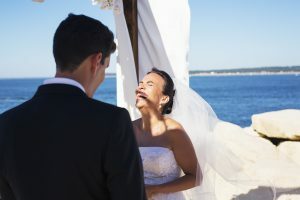 We trusted completely in your guidance and were rewarded with a ceremony that was unique, heartfelt and had our guests in tears of joy and laughter. We would highly recommend you anyone. You put in so much hard work on the lead up to the wedding, helping to coordinate the readings, guide us in writing and translating our vows and finally bringing everyone together in a moment of beautiful celebration. Oprah and Pape DIOP, June, 2016. Château de la Ligne, Lignan-de-Bordeaux, FRANCE. My husband and I would love to thank you for the amazing job you did. You truly made our ceremony magical and effortless. Your organization and timelines made everything easy and hassle free. Thanks once again for a great job! Akram et Pilar Alaoui, Châlet des Iles Daumesnil, Paris, FRANCE. July 2015. “Un mariage magnifique!! Un moment plein d’émotions, un discours pleind’amour et très touchant, une cérémonie du sable magique! J’en ai encore la larme à l’œil rien que d’y penser !! Merci encore Blanca d’avoir illuminé cette belle journée et d’en avoir fait un jour inoubliable! !” Samir Yaici. July, 2015. Châlet des Iles Daumesnil, Paris, France. 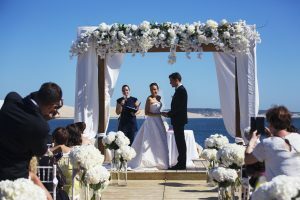 Working with Blanca for several months was one of the best experiences, see the commitment and the pleasure she takes from her job is to admire, the way she gives the Celebrant service is extraordinary. Being at the wedding industry for more than 4 years, has given me the opportunity to see several Celebrants and ceremonies, many of the celebrants give the same lectures, words more words less. The first time I listened Blanca’s ceremony, she captivated immediately my attention as her speech and her ceremony stood out from the rest. She is such a sweet and emotive person when she talks, that she softens even the hardest heart. The interest she has to get to know each couple’s story is an added value, as it makes each ceremony a memorable moment for every couple. 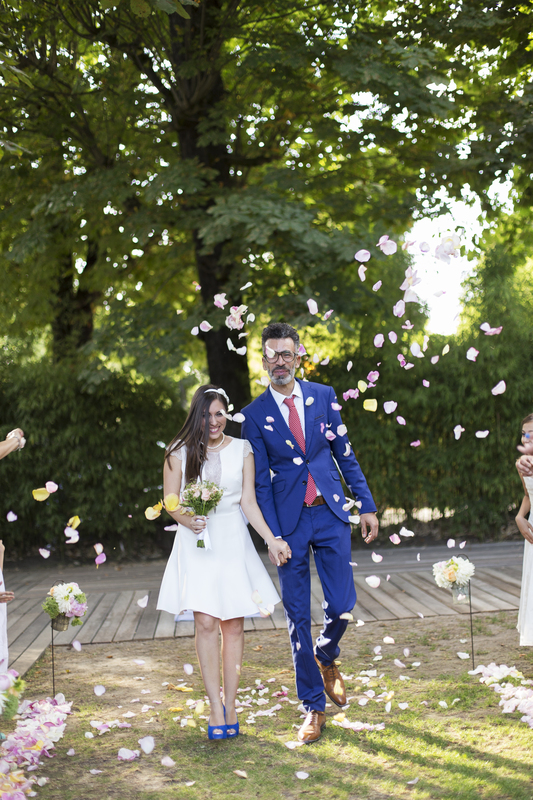 She personalizes the ceremony and makes them feel that a longtime friend is marrying them. 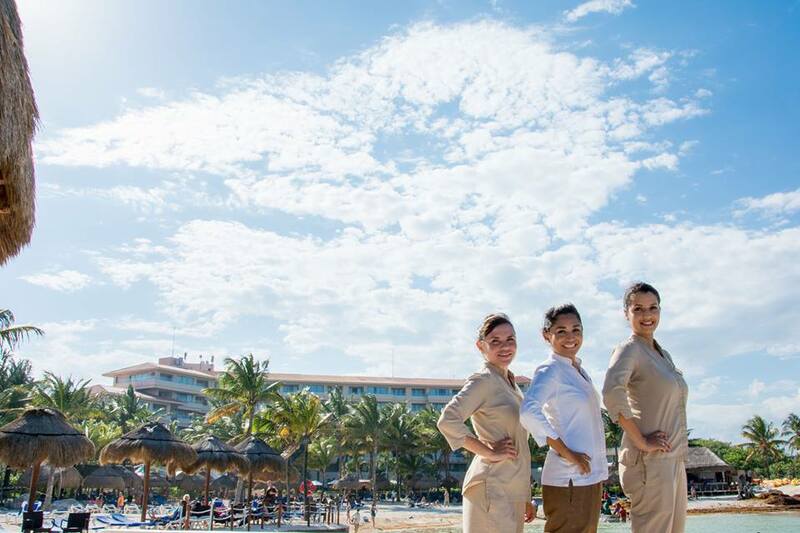 Professionally, Blanca is exceptional, punctuality and responsibility are two points that she covers completely. 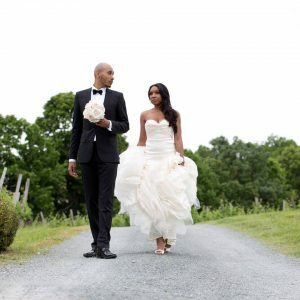 Whether you are a wedding planner or the bride directly, you will be fortunate to get to meet her and work with her. Hire her will be the best decision for such a special day. Luz Jimenez Coordinadora de Bodas, Occidental Grand Xcaret. Riviera Maya, Mexico. 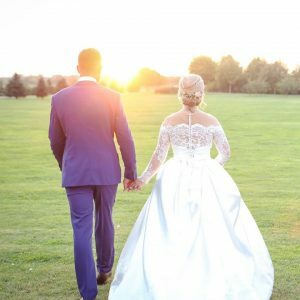 Trabajar con Blanca a lo largo de varios meses fue una de las mejores experiencias, ver la entrega y el gusto por su trabajo es de admirarse, la forma en que da el servicio de boda es extraordinario. 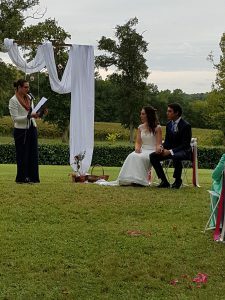 Al estar en la industria de las bodas por mas de 4 años, he visto diversos Ministros y diversas ceremonias, muchos de ellos tienen las mismas lecturas, palabras mas, palabras menos, al escuchar por primera vez a Blanca cautivo inmediatamente mi atención al ver que su ceremonia y su lectura resaltaba del resto, es una persona extremadamente dulce y emotiva al hablar, que ablanda hasta el corazón más duro. El interés que tiene por conocer la historia de las parejas es un valor agregado, ya que hace de cada ceremonia un momento memorable para cada pareja al personalizar la ceremonia y hacerlos sentir que los esta casando una amiga de años. Profesionalmente Blanca es excepcional, la puntualidad y responsabilidad son dos puntos que ella cubre en su totalidad. Ya seas coordinadora de bodas ó la novia directamente, te sentirás muy afortunada de haberla conocido y trabajar con ella. Contratarla será tu mejor decisión para un día tan especial. April Sedenquist, Riviera Maya, MEXICO, Feb 2015. Jennifer & David Heisler. Ocean Turquesa- Riviera Maya, Mexico. Feb, 2015. In a few words… you are so professional and amazing. I haven’t heard any other lovely and sentimental ceremony like yours. Definitely you make every couple feel your words from the deep of their hearts. You do such an amazing job!!! love you, you are the best!! “We had the great pleasure of having Blanca Bertely perform our wedding ceremony on February 17th 2015. The setting was idyllic, on the sunny beach in Puerto Morelos Mexico. Surrounded with friends and family the day was perfect. “Very friendly, personable, and professional. I would highly recommend Celebrant Blanca to anyone and everyone! ” 30 year vow renewal. 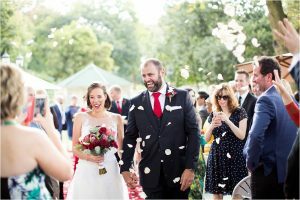 “The wedding officiant, Blanca was also poignant, pleasant, and several guests said that what she said was so great that they cried. She did a handfasting ceremony which we requested, which was also interesting and beautiful. Her English was excellent.” Destination Wedding at Now Sapphire. February, 2014, Theresa and Chris Pemble. El Dorado Royale – Riviera Maya, Mexico. “Special thanks to Celebrant Blanca Bertely for conducting the ceremony to renew our wedding vows, it was such a special occasion, so personal and intimate, just what we wanted. 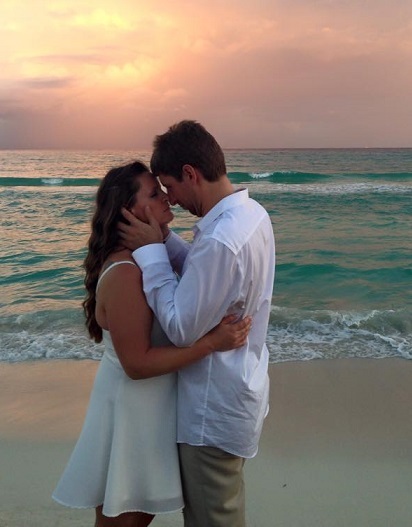 Perfect in every way.” Vow Renewal.